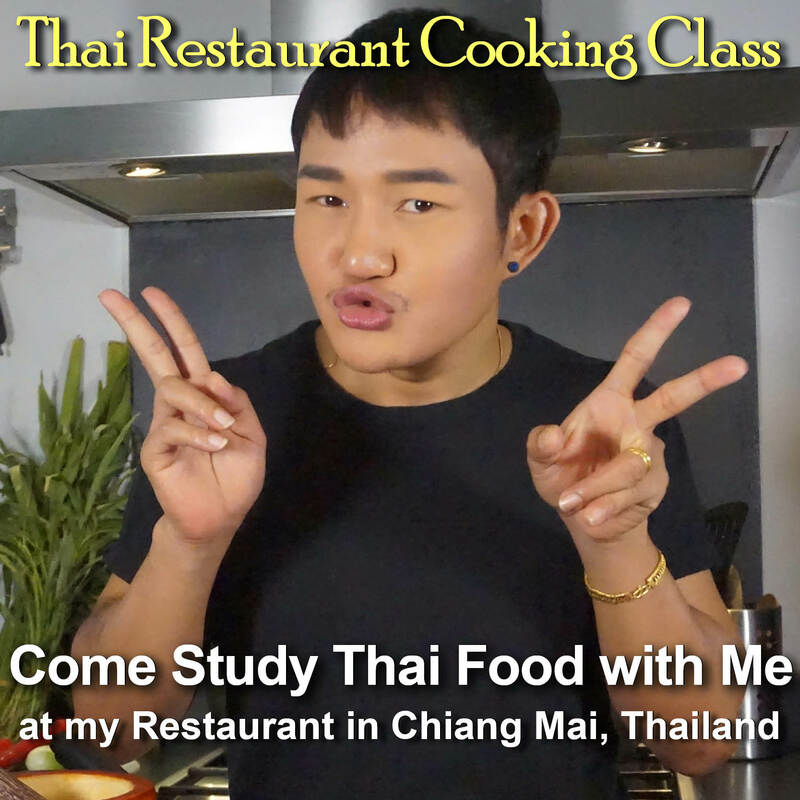 This delicious Thai-style chicken stew known as Tom Khing Gai (ต้มขิงไก่) is made with big juicy pieces of chicken leg meat with the bone and skin left on. 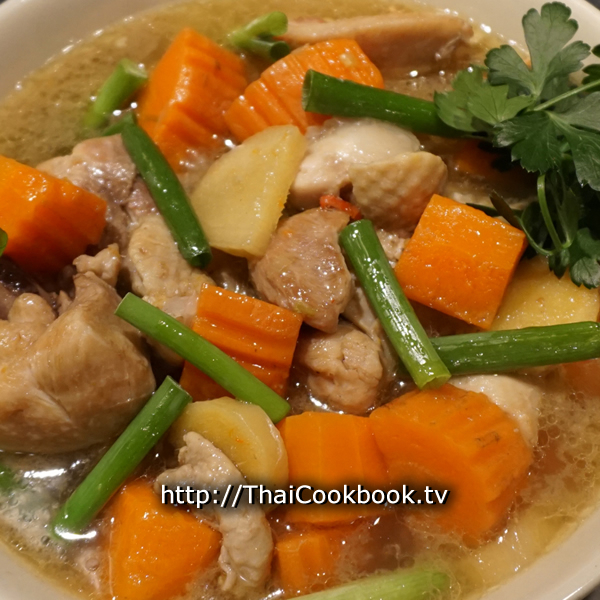 The chicken is slowly cooked in a rich and warming broth flavored with a generous portion of tangy fresh ginger, chunky and sweet pieces of carrot, onion, and just a hint of hot chili. The result is a very special chicken soup with an almost medicinal nature that is sure to cure whatever ails you, even if you are just plain hungry and need an easy pot of something for dinner. 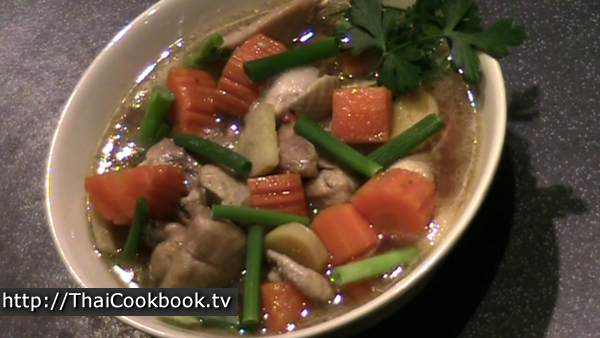 What's in our Ginger Chicken Soup. 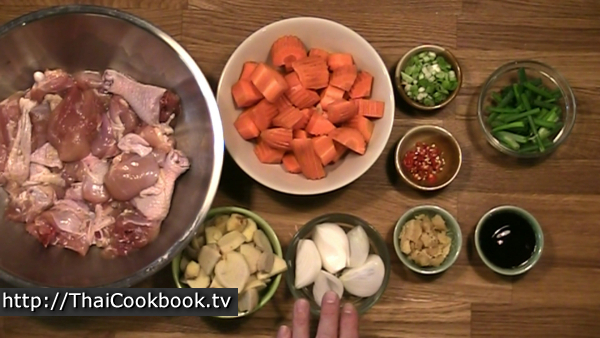 How we make our Ginger Chicken Soup. 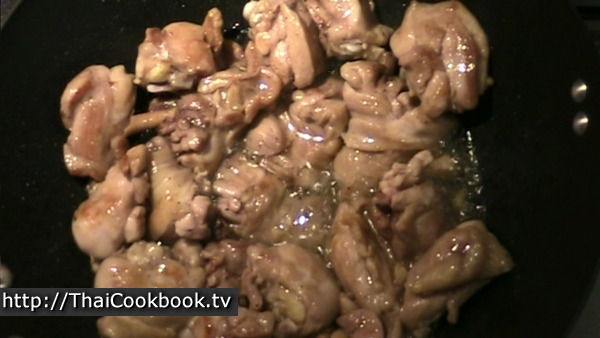 1) Cut the chicken and brown it in oil, then drain well. 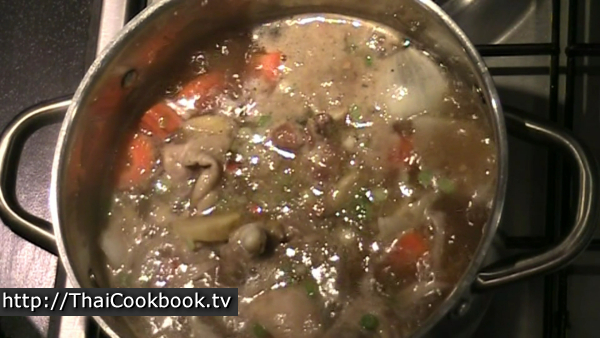 2) Add water, sugar, and oyster sauce to a big pot and bring to a boil until sugar dissolves. Add everything else to the pot and cover with more water. 3) Simmer for 45 minutes or until carrots are cooked. Serve. 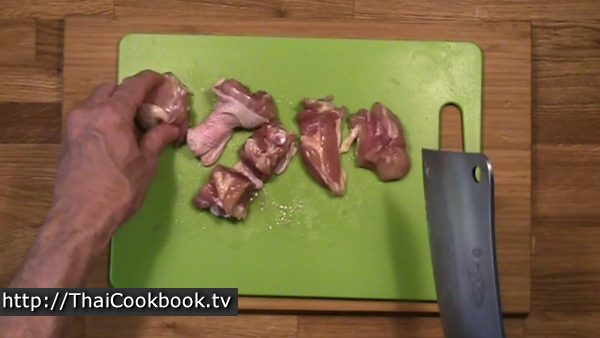 Cut the whole chicken legs, cracking the bone with a meat cleaver or heavy knife into 2 or 3 pieces each. 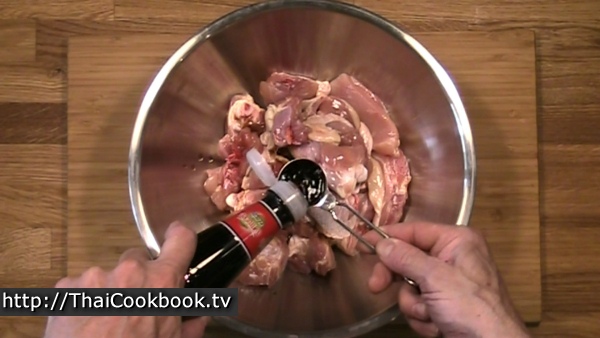 Marinate the chicken in 2 tablespoons of soy sauce for 20 minutes. While the chicken is marinating, peel and cut the carrot into chunky pieces, enough so you have about 4 cups of carrot. Peel the ginger and slice it into 1/4 inch thick pieces. Peel the onion and cut into quarters. Chop the bottom portion of the green onions into very fine pieces, saving the tops cut into one inch long pieces. Chop the chilies very fine. 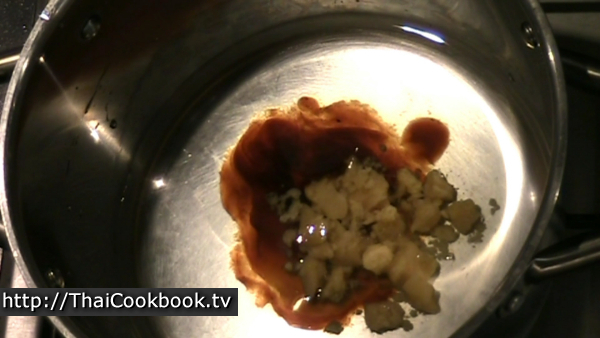 Add the oil to a wok or deep frying pan. Fry the chicken until it is well browned, then remove it and drain the oil. Add 2 cups of water to a big soup pot with a lid. Add the sugar and oyster sauce and bring to a boil until the sugar is melted. 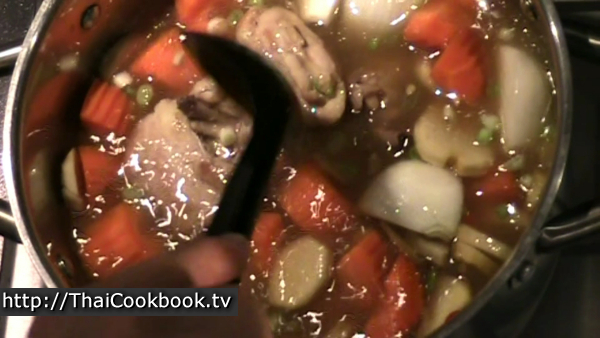 Add the browned chicken, carrot, ginger, onion, chopped green onion and chili to the pot. Add more water until everything is barely covered. Bring to a hard boil, then reduce the heat and simmer, covered, for 45 minutes. 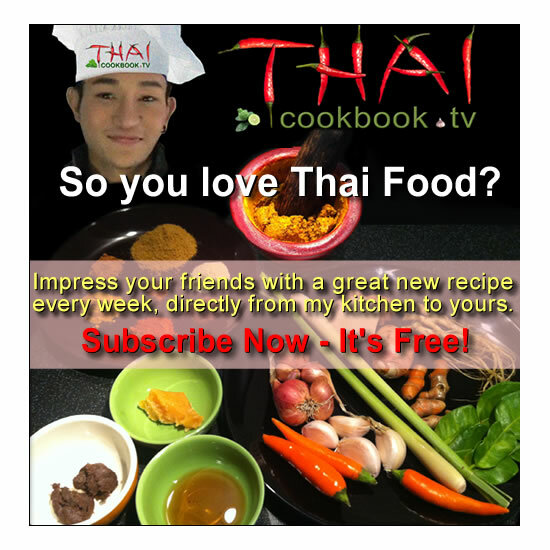 Taste the broth for correct seasoning. If it needs salt add a little fish sauce until the flavor is right for you. Use salt if you prefer, but the broth should not be too salty. Serve in a nice bowl and top with pieces of green onion. Garnish with parsley or coriander tops.